"You think that this material universe is all there is.. But what if I told you the reality you know - is one of many." Marvel has unveiled a new 60-second TV trailer for Doctor Strange, the new super hero movie directed by Scott Derrickson. 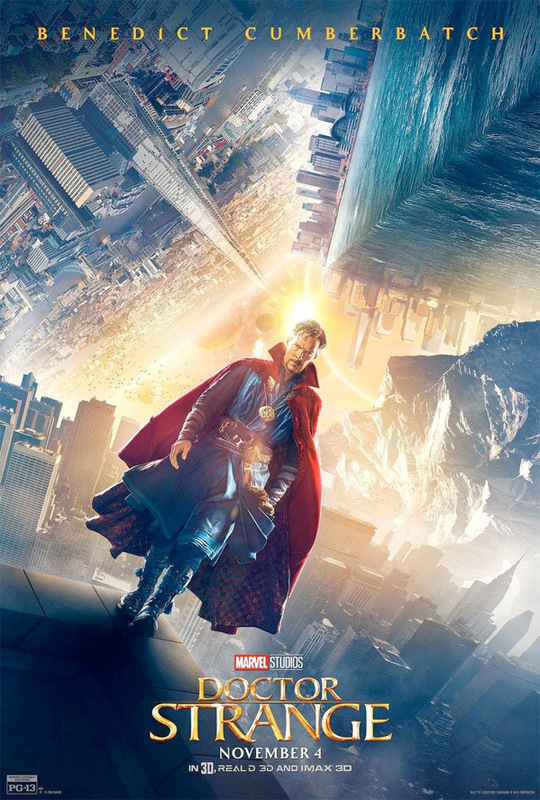 Benedict Cumberbatch stars as the Sorcerer Supreme, a comic book superhero that gains special mystical powers after meeting "The Ancient One", played by Tilda Swinton. The full cast for this adventure features Rachel McAdams, Mads Mikkelsen, Scott Adkins, Chiwetel Ejiofor, Michael Stuhlbarg and Benedict Wong. The more we see for this, the more excited I get - it looks so awesome. IMAX is also hosting a special preview event in October to see 15 minutes of footage from this movie, click either new poster below to grab tickets to one of the screenings. Don't miss out on this one. You can still watch the first teaser trailer for Marvel's Doctor Strange, and the second full trailer here. Benedict Cumberbatch plays Doctor Strange and Tilda Swinton plays The Ancient One. The script was originally written by Thomas Dean Donnelly & Joshua Oppenheimer, with work by Jon Spaihts. Doctor Strange follows a once brilliant neurosurgeon forced into retirement after a car accident destroys his once skilled hands. He then meets the Ancient One on a trip to Tibet and learns to become the Sorcerer Supreme. After filming in London for the last four months, the film is being prepared for release this fall. 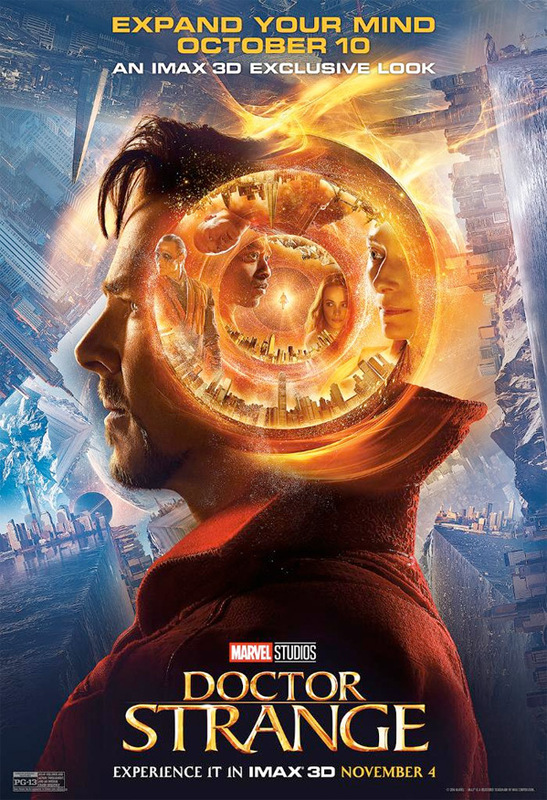 Doctor Strange is directed by American filmmaker Scott Derrickson, of the films The Exorcism of Emily Rose, The Day the Earth Stood Still, Sinister and Deliver Us from Evil previously. Disney will release Marvel's Doctor Strange in theaters everywhere starting November 4th, 2016 later this year. Excited for this yet? Ah man! This is going to be quite the show! Really love the magic repeating on the buildings and all the patterns. I don't want to be a killjoy, but I am not happy with what I've watched so far. And I really want this to be good. I like the character. I like cumberbatch. But these folding buildings aren't magic. Magic is a mystical and obscure (occult) science. this is a real lack of imagination. I figured it would have a psychodelic look to it. This is just Marvel Inception. If this is the case, it would be a big let down for me. Agreed - the elements of Inception and Batman Begins are a concern. To be fair, shaping of reality like seen in the trailer was Doctor's domain way way before Inception was even written. How ? I wasn't a huge Dr Strange fan back in the day (Spidey, Iron Man and X-men only), so I can't remember this inception-like magic. Please refresh my memory.